Tracy Della Vecchia answers this important question. This is useful information to know, because you can't send a letter until you get the platoon number. Recruits perform a close-order drill movement during a drill evaluation Aug. 24, 2015, at MCRD Parris Island. The strict, particular nature of close-order drill reinforces discipline and precision and fosters unit cohesion. —USMC photo by Lance Corporal Vanessa Austin. This is an important question because we can't send a letter until we get the platoon number. The address for each company is public knowledge, but mailing a letter without a platoon number causes big delays. The wrong platoon number causes even more delays. So here's the TOTAL scoop on this question. Your recruit will fill out a form letter and hand-address it to you on the FIRST Sunday in boot camp. For example, if your recruit's first Sunday in boot camp is March 8, the letter will be mailed the following day, Monday, March 9. Families can expect to receive the form letter from their recruit by Thursday or Friday of that week. The amount of time it takes the letter to reach you will, of course, vary based on locations and postal facilities. It will arrive via standard US Mail. Now, some of you are going to get impatient and other groups will encourage you to call your recruiter or the recruiting office to ask for the platoon number. And you can do what you want to do, but I would discourage that. The Marine Corps uses proper channels for communication and respects the chain of command. Asking a recruiter to do that for you would be asking him to deviate from the standard operating procedure (SOP). The recruiter may do it for you because he wants to help out, or he may not. Either way, I'm going to discourage you from asking your recruiter for multiple reasons. 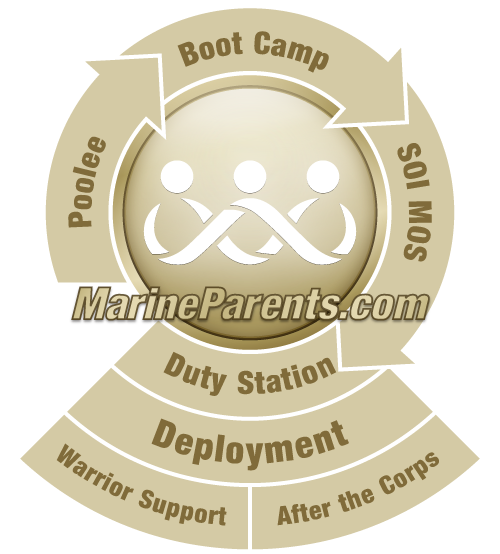 It's disrespectful of the chain of command and Marine Corps SOP, it disrupts the normal flow of mail, your recruit's platoon number could VERY likely change, and with the HUGE influx of mail to brand new recruits, it makes it really hard to sort the mail and then creates a delay for the entire company. The other thing that will happen is that people who have joined this group under some kind of alias name will send you a private message asking you to give them your recruit's full name and they will in return give you his platoon number. I can't even begin to tell you how WRONG this is on so many levels, but they will try to get away with it. Please don't provide them with any information. And please report those people to us so we can terminate their membership in this group. So be patient, and let everything unfold as it should. Your recruit is doing what he or she should be doing, and we, as a group, are trying to do the same. Write your letters, put them in envelopes, number each one so your recruit opens them in order, and set them aside until you figure out the platoon number. That's the safest and most respectful way to get our letters to all of our recruits in reasonable order and in good time. Written by Tracy Della Vecchia on 03-04-15.